Last night, I found out about a teacher in Singapore who was apparently under so much stress that she slit her wrists and jumped from the 13th floor, killing herself. Suicide and psychological distress continue to be problems in Singapore, with the Samaritans of Singapore (SOS) reporting 422 suicides in 2013, with young people below the age of 30 making up about a hundred cases (24%). If you hate reading long articles and don’t want to continue reading to the end, just take away one thought from this article: All of us suffer. Some of us are anxious, depressed, and even suicidal. Let’s be kind to one another. All of us suffer. Some of us are anxious, depressed, and even suicidal. Let’s be kind to one another. While mental health issues have already filled numerous bookshelves, it really doesn’t get much more complicated than that. Human suffering is a constant, and we all have the seeds of compassion within us to help those who suffer. If any of us sees a child on the verge of drowning, very few of us would hesitate to help. Let us all admit it now: all of us suffer. Sometimes it may not seem that way, given all the shiny, happy people we see on Instagram and Facebook. But of course, we’re all very eager to highlight the positive aspects of our lives, and few of us actually reveal the depths of our psychological distress online. Teachers here work about 56 hours a week — that’s 10 hours per day from Monday to Friday, with 6 hours to split between Saturdays and Sundays. Moreover, 46% of our teachers wonder if it would have been better to choose another job — almost one out of two teachers teaching our children wonder if they screwed up when they signed that teaching contract. With such long working hours and the widespread feeling of regret (“this might be the wrong job for me“), it really would not be surprising to find out that some of our teachers suffer from depression and anxiety disorders, which are common ailments in Singapore anyway. Our education system doesn’t only result in students that are stressed out, even our teachers are suffering. We don’t talk a lot about mental illness in Singapore, but we should — it affects one in six people in Singapore. Let’s get some myths out of the way. People who suffer from psychological distress or mental illness don’t automatically become less able to work or operate as human beings. In fact, if you hire someone with a history of mental illness, you may be getting someone smarter and sharper than the typical hire. Unfortunately, mental illness is still stigmatized in Singapore. Employment is harder to come by, for example, once one is labelled as mentally ill. There even seems to be an attempt to sweep even simple psychological suffering under the carpet; when the results of the TALIS survey were out, headlines were carping about how 88% of teachers were “satisfied” compared to the potential distress that many of our teachers face. Many people don’t see the link between psychological distress and society, but here’s a bit of common sense: a teacher in distress who comes from a family with inter-generational riches has the option to stop working in order to recover. A teacher who comes from a poor family does not have a similar option. 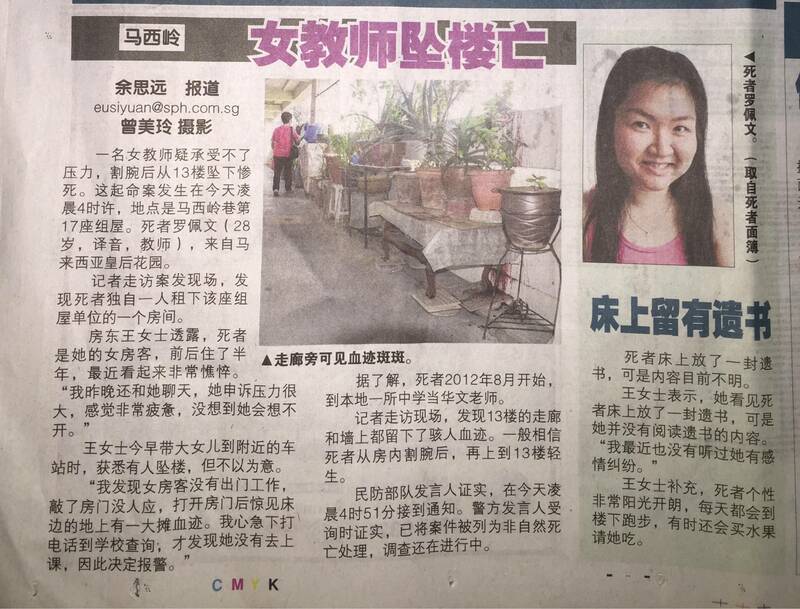 The teacher who committed suicide came from Malaysia, and lived in a rented flat. Of course, we can only speculate about the causes of her death, but the link between suicide and mental illness is a proven one. Unfortunately, there also seems to be a link between inequality and mental illness. In other words, the richer a person is, the less likely s/he is to be depressed or suicidal. How should we respond to this particular teacher’s suicide, and suffering in general? On a very simple level, we only can be kind to each other, and adopt a more compassionate attitude towards ourselves and the world. We need to recognize that suffering is a universal to all humanity, something that we all share in common. In fact, I’d be wary of anyone who claims s/he doesn’t suffer — we all need a dose of self-doubt and dissatisfaction to regulate our own actions. Sweeping psychological distress under the carpet should no longer be an option.